What a better way to celebrate the holidays than with a reminder of how much we love to go to parties? 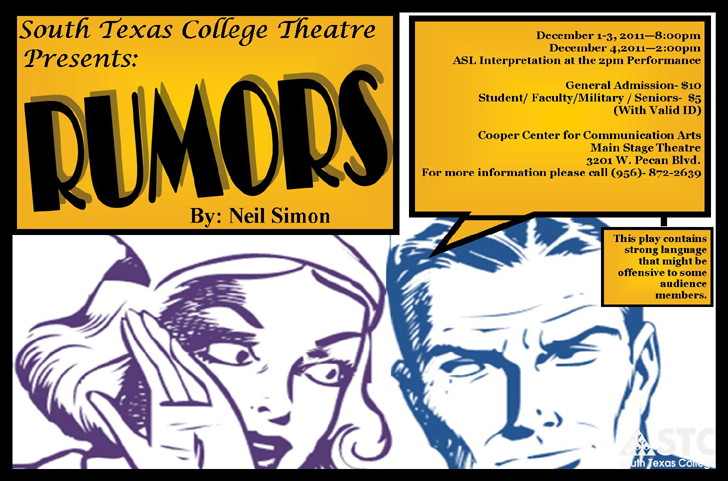 That is unless you are a character in Neil Simon’s play, “Rumors.” South Texas College’s Theatre Department will kick off the winter holidays with Simon’s successful Broadway show, which runs from Dec. 1 to 3, 2011 at 8 p.m., with a Sunday matinee on Dec. 4 at 2 p.m. The “party” will be held at STC’s Pecan Campus Cooper Center for Communication Arts located at 3201 W. Pecan Blvd. in McAllen. Directed by STC Theatre Department Technical Director Jason Lee Huerta, “Rumors” revolves around the tale of four couples. They are all at the townhouse of a deputy New York City mayor and the mayor’s wife for the celebration of the couple’s tenth wedding anniversary. However, the party never begins because the host has shot himself in the head and his wife is missing. His lawyer’s cover up gets progressively more difficult to sustain as the other guests arrive and nobody can remember who has been told what about whom. Doors slam and hilarity abounds as the couples get more and more crazed. Tickets are $5 for STC students, faculty and staff members, senior citizens, and members of the military. General admission is $10. The Sunday matinee production will be interpreted in American Sign Language by student interns from STC’s Interpreter Training Program.